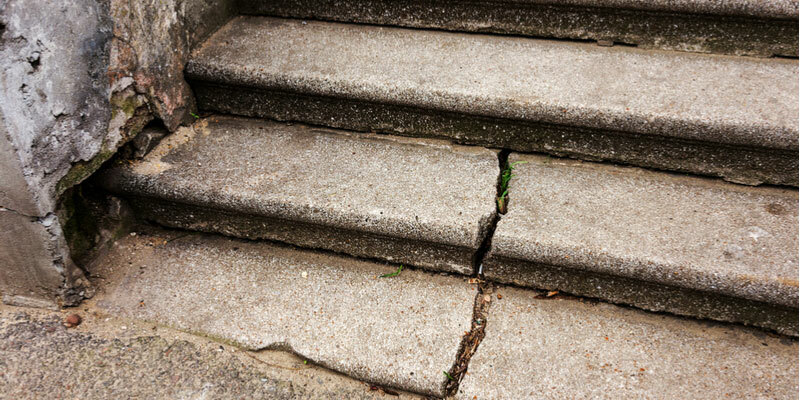 Concrete step repair is a common necessity as foot traffic will wear down even the toughest set of stairs over time. Taking care of repairs as needed will keep steps looking good and lasting for a long time. Ignoring concrete step repairs only leads to quicker deterioration of surfaces. Sudden trauma can create large damages, but usually, damages start out small and then grow into something more. Stained concrete is a common issue. After all, concrete is a light surface that comes into contact with a lot of different elements. Stains in hidden areas don’t need much attention, but a big stain in the center of the stairs that lead up to your house may cause you to sound the alarm for a solution. Luckily, it’s relatively easy to remove most stains from concrete. Plus, there are plenty of solutions depending on the location and nature of the stain, as well as the quality of surfaces surrounding the blemish. Something as simple as oven cleaner can be used to remove concrete stair stains caused by oil, grease, or transmission fluid. Simply spray onto the stained surface and let it sit for 5 to 10 minutes. Then, take a stiff brush and scrub at the stain before thoroughly rinsing the area with your garden hose. Once the structure of the stairs begins to break down, the damages will get worse at a faster clip. This is especially true during cold weather so make sure to conduct repairs before winter sets in – ideally in early fall. Concrete may be too badly damaged to repair, thus requiring a rebuild. But, in many cases, the damaged portion can be fixed without touching the surrounding areas. Fixing structural damage starts with cleaning up the destroyed portion and removing loose chunks. From there, it’s important to tape up the edges so that you don’t get new concrete on your existing (non-damaged) surfaces. From there, holes are filled in, a second coat is added, and the concrete is worked into the area with the proper coating applied on top. The process of patching and resurfacing concrete is best left to a professional. A general way of looking at it is if the area in need of repair requires over 2 inches of material to fix, then it might make more sense to replace the concrete. For smaller damages, there are many different products available to easily address the situation. A professional will be able to fix more badly progressed damages than DIY options. Keep concrete surfaces free of deicers in the winter, especially the first year after concrete sets. Need help with your concrete steps? Call Turnbull Masonry! We specialize in concrete installation, repairs, and rebuilds.